The launch of Loop extends the transformation of CBA to a digital bank. removed paper. Loop creates a virtual cycle, a digital financial service that combines payments, savings, insurance, credit – into one solution. The account can be opened on a phone app or website, with no paper forms to be filled. Features of the accounts are the Loop app, Loop store, and Loop card – and combined, these enable access to Loop products. Account owners get access to loans and overdrafts, as well as savings, budget and networking tools to help them grow their net worth and meet their financial goals. The Loop app also helps them control and analyze their spending in support of their financial goals. The primary target is 20 – 34-year-old entrepreneurs, followed by 35+-year-old established bank customers. One can open a Loop account right on the app or website, and there are six Loop centers (Sarit, in Nairobi CBD, Yaya, Buru Buru, Rongai, and Garden City). Loop is an electronic-only account, and customers won’t get served at CBA branches. This is similar to M-Shwari. Agreeing to the T&C’s also grant the bank the right to access a user’s mobile money information from telco’s. To get finance, loan insurance from CBA (from death & disability) is mandatory. A debit card (not a credit card) is provided, which can be loaded, can be used to deposit and withdraw cash at an ATM. Account holders can also sign up for CBA investment products that range from between 3 to 12 months. Any disputes that can’t be settled with bank staff, can only go to mutual arbitration (not a court). 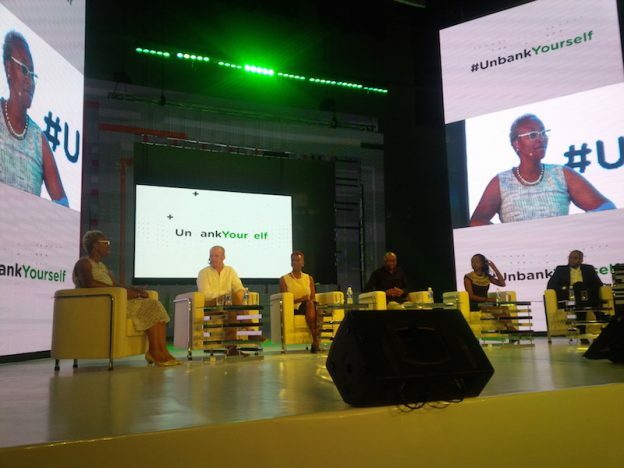 The launch had a nice panel discussion that highlighted the disconnect between bankers and entrepreneurs. This entry was posted in bank service, CBA, SME solutions and tagged loveloop, unbankyourself on March 13, 2017 by bankelele.